Do you know if any of these notes still exist? If so how might I go about getting one? This is the only one I have seen. I guess they turn up in auction sometimes. Notes of this bank are scarce and seldom turn up. I like the design and the artistic signature. It is interesting to see that the note is part issued with the signatures added but no date or number. It seems that private banks had differeing procedures for the issuing of their notes. Given its longevity, this would indicate that the bank was not a prolific issuer. Barrow’s book, 'The Emergence of the Irish Banking System', provides interesting information about the history of the bank. Joseph Pike was the sole partner from 1801. The bank closed in 1826 upon his death. All liabilities were paid in full from the bank’s gold stocks. This may explain why its notes are difficult to obtain. 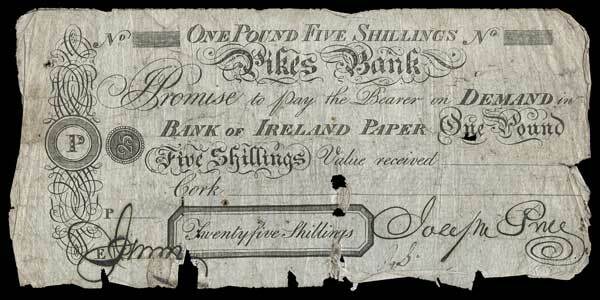 Paper Money of Ireland mentions a number of denominations so some may eventually turn up for sale.